Someone has been killing off members of a family named Hartley, the father who is owner of stagecoach line and a son who is a Texas Ranger on leave. They've even killed Anne Jeffreys father who was the senior Hartley's partner. That leaves only Kirk Alyn and the bad guys are gunning for him too. Which is why in Overland Mail Robbery Wild Bill Elliott who is also a Texas Ranger agrees to pretend he is the last of the Hartleys. This is necessary because Alyn is a tenderfoot out west, he's been living in Boston. In the meantime Elliott does his investigation. Suspense is lacking because we know right away who are the bad guys and they're led by a woman named Patterson who is a sweet old lady played by Alice Fleming and who runs the general store. She's got a banker son played by Weldon Heyburn and a thug son played perennial Republic Studios villain Roy Barcroft. And a seductive niece played by Nancy Gay who blows Elliott's cover and nearly gets him killed. What's ironic here is that Fleming later went on to play the Duchess who was the aunt of Red Ryder in that series and Red Ryder was played by Bill Elliott. She makes Ma Barker look like a Golden Girl. 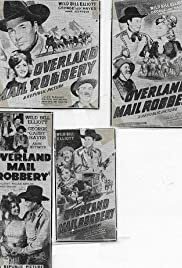 No suspense, but lots of action in Overland Mail Robbery and of course Gabby Hayes.